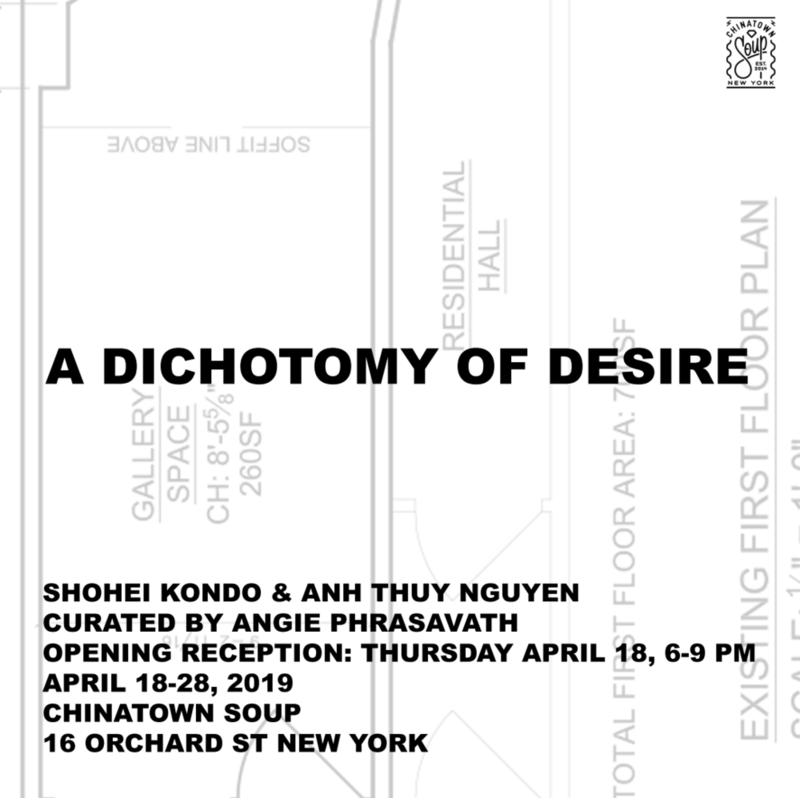 From April 18th to 28th 2019, Chinatown Soup is pleased to present A Dichotomy of Desire, a duo exhibition featuring works by two artists, Shohei Kondo and Anh Thuy Nguyen curated by Angie Phrasavath. The opening reception will be held on Thursday, April 18th from 6pm to 9pm. subject. Laughter and pain, humor and seriousness, the duo presents a dichotomy of visual lyricism that is direct and individualistic in response to a much-spoken subject in history. Simulationism of the 1980s. His work expresses a distance from the body by handmade brush strokes that have been perfected to match the appearance of mechanical production. In his paintings, representations of the bodies in sexual poses and cultural taboo are flattened, even abstracted into computer-like sketches, rendering the subject casual and comical. Kondo’s work mocks the cultural ideology of eroticism by remarks of pleasure, laughter and relief. unremoved. Fleshy silicone paired with solid, cold metal, Nguyen’s sculptural “body tools” encourage imagination of a desired longing between the bodies they apply, while refuting real chance of closing their actual distance. Her work probes the contemporary aporia of desire which is scaffolded by agony and impossibility. Shohei Kondo (b. 1986, Japan) is a New York-based artist from Japan. His work has been exhibited internationally and venues including, Amakei Gallery (Japan), China Academy of Arts Museum (China), and SVA Chelsea Gallery (United States). He is the recipient of the Sanwa Award (Japan) and his work is in private collections in the United States and Japan. Kondo holds a BA in Film Studies from Takarazuka University of Arts and MFA Fine Art from School of Visual Arts in New York. Anh Thuy Nguyen (b.1993) is an artist from Hanoi, Viet Nam. She earned an M.F.A in Fine Art from School of Visual Arts (2018) and a B.A in Studio Art and English (Writing) from DePauw University (2015). Anh Thuy has exhibited at Miyako Yoshinaga Gallery, Sotheby’s Institute of Art (New York), BOSI Contemporary, The Java Project, Pfizer Factory, Trestle Gallery, Nha San Collective (Hanoi, Viet Nam) among others. Residencies include Brooklyn Art Space, Vermont Studio Center. Anh Thuy Nguyen is currently a member of Brooklyn Art Space –Trestle Projects and Adjunct Professor at Hudson County Community College (NJ). History from James Madison University in Harrisonburg, Virginia. From there, she earned her M.A. from Sotheby’s Institute of Art in Art Business. She is currently the Growth Manager of Eazel, a technology platform focused on accessibility and education for the visual arts based in New York. She also writes and conducts interviews about modern and contemporary art.